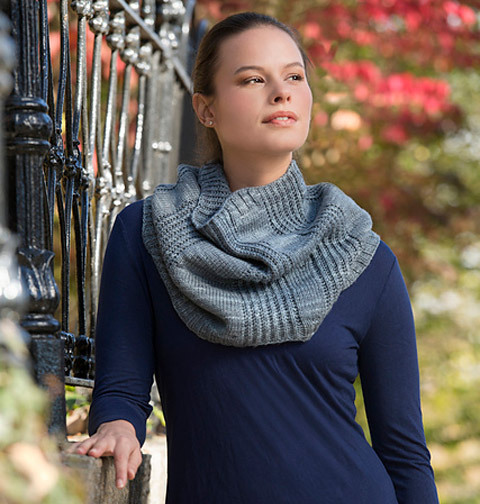 This big cozy cowl combines brioche panels, stockinette stitch, and subtle shaping for a modern geometric design. The brioche sections are simple and straightforward, making this cowl a great tool for learning the stitch. Yarn Zig Zag is worked in a worsted weight wool at 19 sts/31 rows over 4"/10 cm in stockinette stitch. Shown in Miss Babs Yowza in Slate. Size 36” circumference at the bottom, 28 1/2” circumference at the top, and about 16” tall. Fingerless mitts are a great project for learning a new technique: you get a little practice working a new stitch and the instant gratification of a quick knit. 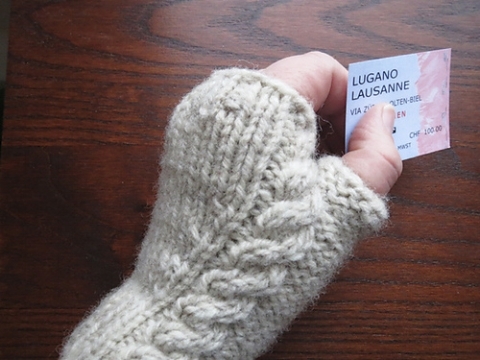 These mitts are worked with a yarn that shows off the closed loop cables beautifully and feels luxurious to wear. Yarn Mt. Battie Mitts are worked in a worsted weight wool at 22 sts/34 rows over 4"/10 cm in stockinette stitch. Shown in Sugar Bush Bold. Size finished hand circumference of about 7 inches fits up to 8” hand, about 7½” inches from cuff to top. These cheerful mittens, featuring an offset scrolling flourish, are sure to brighten a snowy winter day. Size finished hand circumference 8", length 10"
A bold graphic cable zigzags down a striped garter stitch back drop. Slalom is knit with a deep ribbing for extra slouch so you can fold up the brim to keep your ears warm while you are on the slopes. Yarn Slalom is worked in two colors of a DK weight yarn at 21 sts/40 rows over 4"/10 cm in garter stitch. Shown in Madelinetosh Tosh DK in Flame. Size finished circumference 13¼ (15, 17, 19, 20¾)”, finished height 8 (9, 10½, 11, 11½)”. Stranded colorwork, garter stitch stripes, and short rows combine to create a hat that will keep you warm whether you are trekking through the alps or building a snowman in your own backyard. Yarn Matterhorn is worked in a worsted weight wool at 21 sts/28 rows over 4"/10 cm in stockinette stitch. Shown in Malabrigo Worsted in Taupe. Size finished circumference 15½ (17¼, 19, 20¾)”, finished height 7½ (8, 9, 9½)”. Unique construction makes a small bit of colorwork the focal point, while the garter stitch assures this will be a warm and cozy cap. Yarn Alpine Flower is worked in 3 colors of an aran weight yarn at 21 sts/40 rows over 4"/10 cm in garter stitch. Suggested yarn - Berroco Tuscan Tweed. Size finished circumference 17½ (18, 20)”. With a wide textured brim and gathered crown, this hat is worked in several contrasting colors and is perfect for using up small amounts of yarn. Yarn Granite is worked in a worsted weight yarn at 21 sts/21 rows over 4"/10 cm in stockinette stitch. Shown in Berroco Ultra Alpaca. Size finished circumference 14½(16, 17.½, 19, 20½)”. Yarn SBB Mitts are worked in an aran weight wool at 16 sts/27 rows over 4"/10 cm in stockinette stitch. Shown in Blacker Yarns Norfolk Horn Aran. Size finished circumference 6 (7, 8)”. A unisex beanie featuring a twisted stitch design inspired by the architecture of E. Fay Jones. Twisted stitches and cables make this a fun to knit hat. Yarn Skull Coast is worked in a DK weight yarn at 25 sts/30 rows over 4”/10 cm in charted pattern. Shown in O-Wool Legacy DK in Overcast. Size finished brim circumference of 18”, can stretch to 23” when worn. The intertwining horizontal cables of this beret show off the depth of color in a tonal yarn. Cables and lace make for potato chip knitting in this pretty hat. 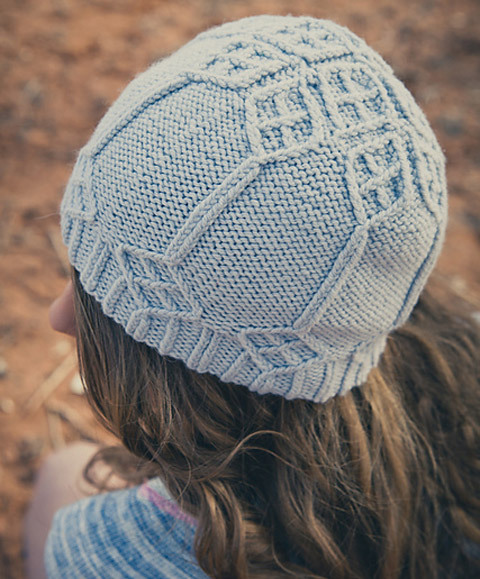 A simple lace panel adorns a slouchy hat, angora gives it a lovely halo.